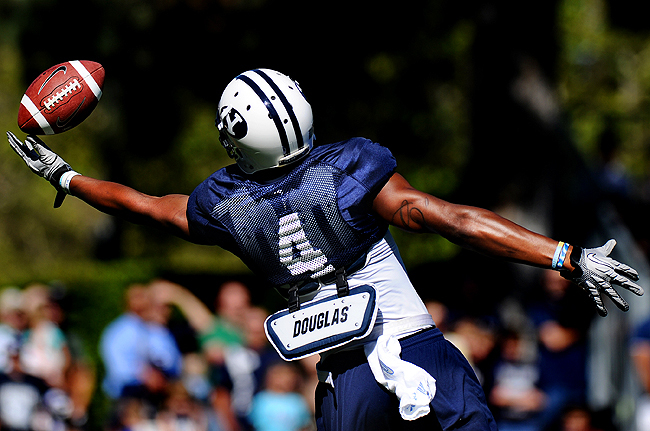 "BYU wide receiver O'Neill Chambers (4) gets a gasp from the crowd as he pulls in a one-handed catch during practice on Friday, Aug.13, 2010 on the campus of BYU in Provo." Everyday is a challenge in photojournalism. Every morning I find out what I am shooting, but there is no guarantee that those assignments will stick. Even if they do, the ways of assignments change. Such as BYU football practice the other day. I am not sure what changed, but I wasn't allowed inside the ropes at practice the other day. Every time I slipped under, a field enforcer would tell me I wasn't allowed to be where I was. I even explained many times who I was shooting for and that I was out of the way of spectators. I became frustrated. I did my best to seek out the best vantage points behind the ropes and still do my job. That's when I saw our video guy where we normally were able to be. So I ran out next to him. But since we're are only allotted around 30 minutes to shoot, I was running out of time on the field. Despite being on the wrong side of this play, I felt good to get something this visual and the talk of the day of practice in such a short period of time. A small victory for the assignment, day.